for years and years in radio, but also everything else he did. Bob is an icon in Our Town, of a man that’s been around for a long time, and is still active. I’m so very delighted for us to have this chance to talk about what you and I grew up in as radio television. Bob Levey:	Andy, I appreciate the chance to be here, but what are we going to do? My ears are burning from that introduction. Do you have a fire extinguisher? Andy Ockershausen:	No, no money. Bob Levey:	Well that’s no different from the old WMAL, right? Andy Ockershausen:	The old WMAL. I used to have the argument all the time about the talent, and I said look, we’re not in business to make you money. We’re in business to make The Evening Star money to keep ‘em alive, and we did for a while. Andy Ockershausen:	That’s another story. Bob Levey:	It is a long story, it is another story. Andy Ockershausen:	But you lived through it. You lived through the golden days of The Washington Post, and every day I think about how great The Post has been to Our Town, and to our people. Like it or love it, some people hate The Post, some people love it. But it’s been a rock in Our Town. Bob Levey:	A lot of people don’t understand exactly why it has been a rock in Our Town. It certainly had to do with the unbelievably great Ben Bradlee, whose first hire at The Washington Post, by sheer accident, was me. Bob Levey:	Yeah. It did happen. Andy Ockershausen:	He realized he made a mistake. Bob Levey:	Here was the story: I had a job interview lined up with J. Russell Wiggins, who was the Editor of The Post, and a couple of weeks out, he said come in on Monday morning at 9 a.m. But over the weekend, President Johnson named him the Ambassador to the United Nations, so this new dude took over at 9 a.m. Monday morning, and he inherited Wiggins’ calendar. The first guy he had to see was me. I walked in, and we didn’t know quite what to do with each other, so he hired me on the spot. It was the first of a lot of lucky breaks in my life. Bob Levey:	New York City. Andy Ockershausen:	High school and New York in the city. Then, going to the University of Chicago, which, to me, never meant journalism. Bob Levey:	There was no journalism program at the University of Chicago, but on my first day on campus somebody said, “You really ought to check out the student newspaper for two reasons. One, it’s a whole lot of fun; and two, there are a whole lot of girls there.” I said, “You got the value of this backwards, but I’ll show up.” That began my serious, absolutely over-caffeinated, overwhelming love for the business. Andy Ockershausen:	You had not done that in New York. You discovered that at Chicago? Bob Levey:	No, I was too busy being other things when I was in high school. You’re looking at guy who was an all-city quarterback in football, and an all-met basketball player, and the massively unsuccessful chaser of girls didn’t keep me from trying. Andy Ockershausen:	Yeah, but Bob look, because the experience that you had though, to go through what you did, and be part of the same in New York City, there’s nothing better than the Big Apple to train somebody. Bob Levey:	Well, you never quite leave it, Andy. I’ve lived in Washington now for nearly 51 years. I was born in Manhattan, and raised in the Bronx. I memorized the subways at an early age, and you never forget the subways. I was just up there two weeks ago with my wife, and she said, “How do we get from here to there?” I said, “No problem. We take the E-Train.” She said, “How did you know that?” I said, “Come on, what are you talking about? How did I know that?”	I knew that when I was 11 years old. Andy Ockershausen:	It’s made New York happen, is that subway system, which was put in 150 years ago. Bob Levey:	What is the number now? Is it 50 billion dollars in repairs that they need? You know, here in Washington, we moan and groan when the Red Line is two seconds late. New York is heading for a lot worse. Andy Ockershausen:	That’s a lateral move, in some ways. Andy Ockershausen:	Is that a small world? Andy Ockershausen:	Connect the dots. Bob Levey:	I never did radio in Albuquerque, but the news there was like nothing I had ever seen. You know, I was a big city guy. At that point, the smallest city I had ever lived in was Chicago. There I am in Albuquerque, and this guy says, “If you want to be a success in the news business in Albuquerque, buy cowboy boots.” So I did. I showed up for work every day in cowboy boots. Andy, if I had come to work at WMAL in cowboy boots, what would have happened? Nothing good. Andy Ockershausen:	No. You know, you adapted yourself to the people, rather than the people adapting to you. Andy Ockershausen:	Wonderful market, too. Bob Levey:	The population was about 1/3, 1/3, 1/3 and that meant a lot of opportunities for journalists, but a lot of challenges. Andy Ockershausen:	It really was you had the whole state in your hands. Andy Ockershausen:	No, we’re talking about . . .
Bob Levey:	Okay, I brought it up. Okay. Bob Levey:	Like Ben Bradlee. Andy Ockershausen:	Bill Bradlee didn’t do that. Bob Levey:	Ben did his share of that. Andy Ockershausen:	In the community. Andy Ockershausen:	The golden years of the paper. Bob Levey:	There were lots of golden people there, but I want everybody to understand that the newsroom was not the only golden place there. The most important person who ever worked at The Washington Post was Katharine Graham, by a long way, because she built a business out of really not much of a business. You remember, Andy, when the old line was The Post was the number four newspaper in a three newspaper town? Bob Levey:	Ha, ha, ha. But it was true. Andy Ockershausen:	The Washington Daily News was tweaking them every day. Bob Levey:	Every day, The Star was established and great, The Post was here, the Times Herald before The Post merged with the Times Herald in the 50s was better, and bigger than The Post. It was really not much of an operation. If you look back at what Katharine Graham accomplished, it is really, as the kids say, awesome. She built a Fortune 500 company centered around this newspaper. She made it profitable. I ate breakfast today, thanks to Katharine Graham, and the profit sharing plan that she put into place. Thank you, Mrs. Graham. Andy Ockershausen:	She . . .
Bob Levey:	Thank you, thank you, thank you. Andy Ockershausen:	I know a lot of the guys that worked in the advertising department. They leaped retirement because the retirement was so great from The Post. Bob Levey:	It wasn’t just that it was so great, it was that she made it great. Andy Ockershausen:	Yeah, and good for the people. Andy Ockershausen:	She had her time. Andy Ockershausen:	Oh God, I knew we were going to get to that. Andy Ockershausen:	Jay Berwanger went to school with her, probably. Bob Levey:	Actually, I think they were there around the same time. She might have been a little earlier. She was so good at business after not believing that she could be, that that’s why I had breakfast this morning. Andy Ockershausen:	And she did something else significant. She hired good people. Bob Levey:	She did, and she got out of their way. She let Bradlee have his sandbox, and we all played in that sandbox. It was great. Andy Ockershausen:	Tell me about it. Bob Levey:	Can I tell you one Bradlee story? Andy Ockershausen:	Absolutely. Have you seen the movie? Bob Levey:	Yes, I’ve seen it. Andy Ockershausen:	Did you have a review of it? Andy Ockershausen:	The golden days. Andy Ockershausen:	In the bureau. Andy Ockershausen:	Hitting the right buttons, didn’t he? Bob Levey:	Yeah. He wasn’t playing her in a cynical way. He played her in a way that really mattered to the future of the paper, and he did it beautifully. Andy Ockershausen:	Went a long way. Bob Levey:	They really respected one another, although they were very different people. Bob Levey:	Well, it did. Andy Ockershausen:	By being with The Washington Post, the great credentials to take the next step. Andy Ockershausen:	Tremendous face for radio, too. Bob Levey:	Thank you for that. I knew that was coming. Thanks for not disappointing me, man. I was counting on you there. Andy Ockershausen:	That was a good one. Andy Ockershausen:	You got on the air, and people appreciated you. Bob Levey:	I got on WRC 980. Andy Ockershausen:	Oh my God. Great call letters, great station. Bob Levey:	I had a wonderful experience there, and I was there for a couple of years. I was doing Afternoon Drive right away there. Andy Ockershausen:	With The Joy Boys, were they in their heyday? Andy Ockershausen:	Oh, they had? Bob Levey:	Yeah, but Braden and Buchanan were there, Bernie McCain was there. Andy Ockershausen:	They had talent. Bob Levey:	Mike Cuthbert was doing mornings there, and a young guy would pop in to do the weather on my show, and his name was Willard Scott. Andy Ockershausen:	We know him well. Bob Levey:	So, I’ve been around a while. Andy Ockershausen:	We’re going to take a break here, and come back with Bob Levey, and talk more about his broadcast career, as Evelyn Freyman, the name you must remember. Andy Ockershausen:	Broadcast. This is Andy Ockershausen, and this is Our Town. [GEICO Commercial] Radio Announcer: Okay, Kevin. For the grand prize of one million dollars, what color is the White House? Andy Ockershausen:	He’s a good guy. We like Kelly. Bob Levey:	He is good, but he’s working for a much different newspaper. Andy Ockershausen:	That’s exactly right. Bob Levey:	I can’t really compare Kelly to me, and I can’t compare me to Bill. Bob Levey:	And three different newspapers. Andy Ockershausen:	All of them bring something to the table. Bob, tell us about … You did some television work. Andy Ockershausen:	Oh, Ice Palace. Bob Levey:	That old Ice Palace, remember that? Andy Ockershausen:	Oh, don’t I? Bob Levey:	Now, it’s condos that you can’t afford. Andy Ockershausen:	Will you believe those buildings? Bob Levey:	Gosh, anyway, this what was cool about that. I was on the 6:00 news for years, and in those days, early days of Metro, you could get a transfer, and it was good for two hours. I would go up to WMAL, get a transfer, put it in my pocket, go on the air, do my commentary, and the transfer would still be good, and I’d get on the bus and go home. Andy Ockershausen:	On the same fare. Bob Levey:	Yeah. I loved to say that WMAL did more for my children’s future, than any other station I ever worked for. Andy Ockershausen:	Yeah, but your wife was doing all the heavy lifting. Bob Levey:	Oh, no. This is after that. It was spit out by a machine. Bob Levey:	Oh, those were fun, too. Andy Ockershausen:	See, I’ve been around too long, Bob. But you did have television work at all the local stations, and you grew up with all the local personalities, and involved. Bob Levey:	I did. You won’t take this personally, I hope, but there are people in management of radio and television stations, who are cheap, Andy. When I was on Channel 7, I was there for years. The anchors were Renee Poussaint, and David Schoumacher. Andy Ockershausen:	I know David very … We hired him from ABC. Bob Levey:	Yes, indeed. There were three seats. It was a three shot on a panel, and David and Renee would be there, and the third seat would change depending … It would be the weather person, or the sports person. Frank Herzog was the sports person there then, and Frank and I were, shall we say, prematurely white in the hair department. They had this light that came down on us, and it made people with white hair look as if their hair was on fire. Bob Levey:	If we gave it a chance, maybe our hair would have been on fire. That’s how poorly made this thing is. So Frank and I went to management, and we said, “Guys, we look like something out of a horror movie. Do something about it. Change the light.” They wouldn’t do it. Andy Ockershausen:	That’s a . . . job, too, right? Bob Levey:	Herzog would go on, and these wisps of smoke would be coming out of his head. Then, I’d go on and more wisps. Let’s just say that I don’t think that did a lot for their ratings. Actually, maybe it did. Andy Ockershausen:	I’m sure it did. Bob Levey:	Maybe it was a reason to tune in. Andy Ockershausen:	You know, he was our first guest on Our Town. Bob Levey:	Oh, what a great guy. Andy Ockershausen:	Because … It was just an accident. He was here for the Hall of Fame. Andy Ockershausen:	So we did. We love Frank. He’s a very dear friend. Andy Ockershausen:	The audience loved it. Bob Levey:	Then more than they’re winning now, and the audience loved it. Bob Levey:	I don’t hear anymore, maybe you do, Andy. I don’t hear anymore this idea that you put the Redskins on the television set, and listen on the radio at the same time. Andy Ockershausen:	They don’t do it anymore. Bob Levey:	25 years ago, that was routine. Andy Ockershausen:	Oh my God. Sonny Sam and Frank made the team. It made the chemistry work. Bob Levey:	I mean, it proves yet again, that the personality in radio is everything. Andy Ockershausen:	We do, and we just are so happy that the personalities we’ve had on Our Town, and certainly, Bob, I mean it sincerely. You have done so much. You were a big part of WMAL at one time. Janice was a big part. She still is, as an advertiser. Those days can’t happen again, for whatever reason. I don’t know why. Andy Ockershausen:	Yeah, they could build one. Andy Ockershausen:	It’s a good model. I know what you mean. Andy Ockershausen:	Oh, the degrees. Oh, yeah. Andy Ockershausen:	It leads the nation. Bob Levey:	Yeah, and that alone, plus the car time that everybody’s doing, that should mean that a station somewhat like this one, and maybe this one, could re-establish local products. Andy Ockershausen:	It could be. It’s a commitment of management or ownership. It’s all absentee ownership. Andy Ockershausen:	One of the great things that happened in our company was we were owned by The Star, and The Star took great pride in their broadcast division. Bob Levey:	But this idea that nobody knows or cares about local news is nonsense. The idea that today you are going to put on the radio, and the only person you care about is Stormy Daniels, is silly. It’s just silly. There’s news everywhere in this community, every minute of every day. Andy Ockershausen:	She’s in television the same way as radio. Bob Levey:	Look man, you go raise the money. I’ll do Morning Drive, we’ll be reincarnated, how about that? Andy Ockershausen:	Janny’s got the money. We gotta talk her into this show. Bob Levey:	She’s got the money? Okay. Andy Ockershausen:	She’s so successful. But Bob, I’m going to come back … We’re going to take a break here now, and talk to you more about … I hope you don’t mind, about The Post, and what it means now. I connect Bob Levey with The Post more than I do with WMAL, unfortunately. This is Andy Ockershausen. This is Our Town. Andy Ockershausen: Andy Ockershausen, and I’m talking to Bob Levey about local people he has grown up with in the business, and stayed in the business. It was so important that you were part of the WMAL team in later days. But you know what we went through, and what the city went through. It was local. It wasn’t built … WMAL was local. That was us, local. Andy Ockershausen: Local, local, local. And that doesn’t happen anymore. Bob Levey: I run into people all the time who are in their 70s who say, “I could not have had breakfast in the morning without Harden and Weaver, because I never did have breakfast without Harden and Weaver.” My parents put it on, and I listened to all those jokes about Smokey the Bear and everything, and now they’re 70 years old, and they still remember the jokes. Andy Ockershausen: They also say, “I couldn’t be sure I was going to be on time if I hadn’t heard The Star Spangled Banner.” Nobody plays The Star Spangled Banner anymore. Andy Ockershausen: Do you ever hear it? Bob Levey: No, not ever. Andy Ockershausen: Every TV station used to sign off with it. Bob Levey: I hear it on the football broadcast, by people who can’t sing. Andy Ockershausen: When you went to the station, you were working with talent. Boy, that was a great opportunity. I’m sure you really learned a lot from The Post about the talent, and what they do. Bob Levey: I learned about working in a very talented environment, and what I learned, Andy, was not to try to be better at what they were good at, than certain people were good at. I could never have been a better political reporter than David Broder. I could never have been a better cartoonist than Herblock. Bob Levey: I was working in an environment that they helped to establish. Andy Ockershausen: “Because Harden and Weaver aren’t going to listen to you.” I can tell you that. Bob Levey: All they would have been would have been a pale imitation. Bob Levey: Remind me of this, because I want to cash a bet on this. Were they doing 40 shares at one time in the morning, or was it more? Andy Ockershausen: It could have been more. It could have been almost as much as 50. Bob Levey: Wow. Just get your head around that for a minute. Andy Ockershausen: We had, at one time, one out of every four listeners at any one time would tune in here. Nobody can do numbers, but things have changed, Bob. We were talking, Bob, about your experiences and some of the names that you work with. Following Bill Gold with a challenge had to be, because he was such an icon. Andy Ockershausen: He helped us raise money for Children’s Hospital. Bob Levey: What Bill had established was there was a place for something other than what the President said in the last five minutes. Bill had his flaws, I think. I don’t think Bill ever understood how suburban this community had gotten, and I don’t think Bill had any idea how multi-racial this community had gotten. But I salute Bill, and I salute his memory, because he made it possible for me to write a local column. Andy Ockershausen: Absolutely. He was a good man to follow. Andy Ockershausen: What is that … Cody Pfanstiehl, remember that name? Bob Levey: Yes, I do. Andy Ockershausen: Was he ever a writer at the post? Bob Levey: He was briefly, and then he decided he wanted to eat for a living, and we went to be the Chief PR guy for Metro. Andy Ockershausen: What an opportunity, because that was just getting it off the ground, right? He had it for years. Bob Levey: Cody gave me a great quote one time. I was working on a column about a bus that ran out of gas. Really. Rush hour, 14th Street Bridge, the bus ran out of gas, came to a dead stop on 14th Street Bridge, and I called Cody and I said, “Cody, how in the world could this happen?” He said, “I’ll tell you how it could happen. There wasn’t any gas in the tank.” I felt like an idiot for the first and last time in my life. I said, “Okay, Cody,” and I put it in the newspaper. There it was. Andy Ockershausen: A true story. Andy Ockershausen: And truth is stranger than fiction, you know that. Bob Levey: Ben was like a great football coach. He would cajole you, he would stick needles in you. He would never stop riding you, but it was always for the right purpose, to make you better, not worse. Andy Ockershausen: Right, and make the paper better. Andy Ockershausen: He never flaunted it, that’s right. Bob Levey: Well, he didn’t flaunt it in the wrong way. Andy Ockershausen: We had an AD club meeting, and there was supposed to be this girl. She is a sales manager, she’s in the family … She’s in the Graham family somewhere. She couldn’t make it, so Ben came over. It was right across the street. Ben had the greatest opening line. He said, “Who in the hell is Howard Bomstein?” Howard is a big advertising guy. Andy Ockershausen: That was Bradlee. Bob Levey: Ben was famous for misbehaving in a little boy kind of way. Bob Levey: He got away with it every time. Andy Ockershausen: But that’s what made the paper … That’s what made you great, because you had somebody prodding you all the time. Bob Levey: Well, he also gave me, as Bezos says, runway. He got out of my way, and he said, “Do what you want, just don’t do anything stupid. Don’t do anything wrong, and you can do what you want.” How can anything be better than that? Andy Ockershausen: So many bosses don’t do that . . .
Bob Levey: The guy set the table, and I said, “This is an amazing opportunity, but it will be amazing only if I handle it in the right way,” and I tried to do that. Andy Ockershausen: You sure did. That kept you off of TV a lot, I’m sure. You worked hard. Bob Levey: Well, yeah. I mean, people say what is the secret of this triple career that you had: Newspapers, radio, television, often at the same time? Andy, I did that for years. I would do a radio show, a television show, and a column on the same day for years. What is the secret? Coffee is the secret. Andy Ockershausen: No question. No question about that. Bob Levey: You know, you remember Martin Luther King saying … You remember the speech? Andy Ockershausen: I Have A Dream, yeah. Bob Levey: Yeah. Remember what Kennedy sounded like? I can hit you with that, and you remember right away what he sounded like. It’s true of a lot of human voices. Bob Levey: I’ve been doing a lot of stuff. I’ve been teaching a lot. I had Chairs in journalism schools two times in the last few years. I’m writing books, I am doing a lot of consulting work where I help nonprofits, and sometimes individuals, write better so they can raise money better. I want to say this, too, nobody knows this about me, but I’m a national champion bridge player. Bob Levey: I hire myself out as a partner to people who want to play in bridge tournaments, who are really good. The analogy to prostitution, Andy, is almost exactly right with one major exception … No, we don’t do that, but it’s really the same. You hire me, and I’ll try to make it good for you, but if I can’t make it good for you, no hard feelings, and you can hire me again if you want, and you don’t have to hire me again … So, I am a bridge prostitute. I travel around the country playing bridge. Andy Ockershausen: It’s a travel deal, then. You can go places. Andy Ockershausen: And your reputation is spread around the nation, of course. Bob Levey: This is one of the few good parts of the Internet, I have to say, where after I became a national champion, everybody knew it, and they knew how to find me. Janice Iacona Ockershausen: Do not be surprised if you don’t hear back from some our listeners. Andy Ockershausen: Yeah, we will. We still have people that care about it. Bob Levey: Good, oh, okay. Bob Levey: I don’t even look like a prostitute. Bob Levey: Andy, thank you. Andy Ockershausen: Even seeing you in Guapo’s was a thrill. Bob Levey: Thank you. Guapo’s is always a thrill. Sometimes, not in the right ways. Andy Ockershausen: The next day. Andy Ockershausen: We’ll get into the bridge. We’ll start giving bridge lessons, and not charge ’em. Bob Levey: What? No, no. Andy Ockershausen: This has been so special. 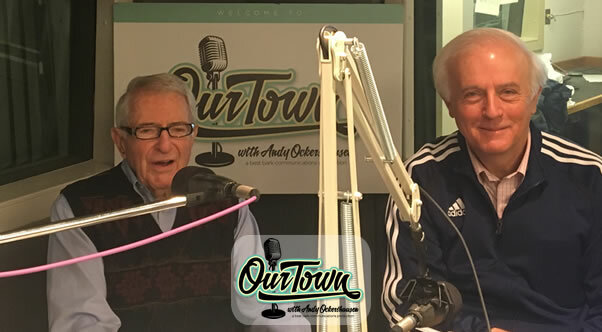 Really, this has been a special edition of Our Town with Bob Levey. We will have you back. Remember that for our fourth season, Bob Levey comes back. Bob Levey: Thank you, sir. Andy Ockershausen: I’m serious about that. This is Andy Ockershausen on This is Our Town. Announcer: You’ve been listening to Our Town: Season Three, presented by GEICO, our hometown favorite, with your host, Andy Ockershausen. New Our Town episodes are released each Tuesday and Thursday. Drop us a line with your comments or suggestions, see us on Facebook, or visit our website at OurTownDC.com. Our special thanks to Ken Hunter, our technical director, and WMAL Radio in Washington, D.C. for hosting our podcast. Thanks to GEICO: 15 minutes can save you 15% or more on car insurance. I met bob today at leisure world.i wore the redskin shirt.i didn’t know he knew.i saw andy score a td for eastern by having his team throwing him over the goal line.does he remember ookie person and billy rhinehart.bill went to work for the telephone co,as did many easterners.chief guyen was the pe coach and played with jim Thorpe. bob.my friend Milton van grack lived in bowie and I have some great stories about their family.